This letter is handwritten by Vincent Gualano, and addressed to the Custodian Department, on July 6, 1940. The Custodian of Enemy Property (CEP), a branch of the Canadian government, oversaw the administration of assets belonging to internees and other enemy aliens. This government office served a dual function. Acting as a trustee for the internee/enemy alien, the office and its agents also protected the interests of the creditors. The CEP would pay off an internee’s debts by selling his or her property or businesses. It also collected money owed to internees by others. Families of internees often did not have access to the husband's assets and bank accounts. As a result, families often had to negotiate with the CEP for stipends for daily subsistence or use of assets like an automobile. In some cases, where assets were lacking, the CEP divested itself of any interest and left the families to fend for themselves. Vincent was the son of Italian-Canadian internee Domenico Gualano. 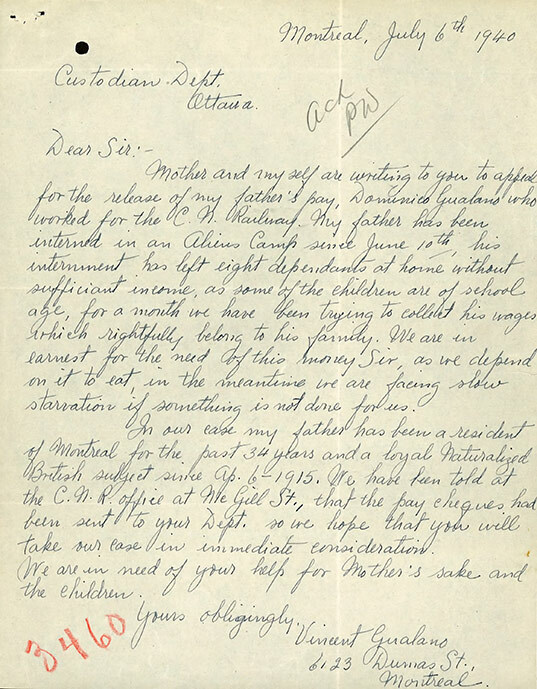 In this letter, he asks that the Custodian release the last paycheck/wages due to his father for his work at C.N. Railway. He claims that the large family of 8 are struggling to make ends meet. He also describes his father as a loyal citizen and resident of Montreal for 34 years.